As part of winning the national bravery award, she may have to sit atop an elephant for parade. 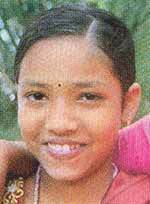 T.A.Shiny, an 8th standard student from Veliyambam Devivilasom School, Pulpally, Wayanad doesn�t have any apprehension on that score, though her mother would shudder at the prospect. Shiny�s mother has reason to be afraid, for it was to save her from a wild tusker that Shiny braved her life. On September 12, 2003, as they were drawing water from the well, their neighbour Leela called them to fetch firewood from the adjacent forest. Thinking that letting lame Leela go alone would be not advisable, they too joined her. It was then that they heard the scream of Leela as a wild tusker rose against her head. In the words of Shiny, �all the 3 of us ran. We hit against a wild creeper and fell. As I looked up I saw the elephant step over my mother. I felt it would come back. I reached near my mother, whose leg had been broken by then. Though mother asked me to go home and fetch help, I did not. I put her hand around my shoulder and dragged her to the riverbank.� It was only after the Herculean effort across 400m then that she shouted for help. It was Sajan, a teacher from her school who forwarded her case for consideration of award. Just as she had no hesitation in the face of calamity, she isn�t perturbed about the prospect of going to Delhi to receive the award. �I will say in Malayalam whatever had happened. Isn�t that OK? "A short cut is often a wrong cut."